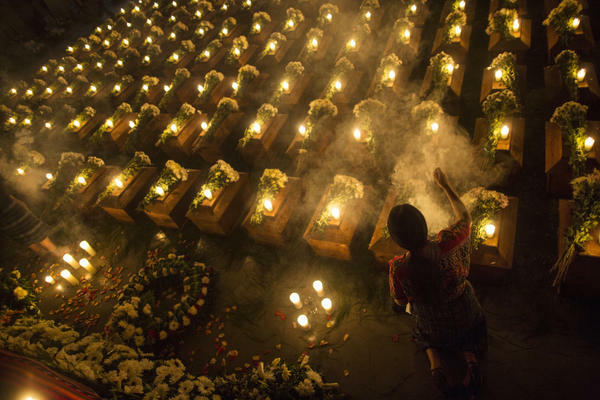 A woman spreads incense over the remains of 172 unidentified people who were discovered buried at what was once a Guatemalan military camp during the civil war in San Juan Comalapa, Guatemala, a day before their formal burial at the same site where they were unearthed. A genetic bank of the unidentified is saving DNA samples from the remains for those searching for relatives. Jo-Marie Burt (@jomaburt) is a senior fellow at the Washington Office on Latin America and an associate professor of political science at George Mason University. Guatemala's ongoing political crisis is having a devastating impact on its people, fueling unrest in the streets and increasingly driving asylum-seekers to migrate to the U.S.-Mexico border. Now, with the country's Congress poised to pass a bill that would free war criminals, there's no clearer sign that rule of law in Guatemala is undergoing a slow, ugly collapse that could spur even more migration to the United States. The proposed legislation, which Guatemala's Congress is expected to debate imminently, would free more than 30 military officials convicted of crimes against humanity and more than a dozen others awaiting trial on such charges. It would also prohibit all future investigations into other cases of grave human rights crimes committed during the country's brutal 36-year civil war that ended in 1996. Should this amnesty bill pass, not only would it undo decades of work to provide justice to victims of wartime atrocities, it would represent an unequivocal return to the reign of impunity long sought by the powerful, military-backed networks of corruption that the United States has invested significant resources into dismantling. Guatemala's civil war and resulting genocide was fueled by U.S. Cold War support for regimes that, no matter how brutal against their own populations, were seen as protecting U.S. interests. United Nations investigators found that 200,000 people died, the vast majority at the hands of the Guatemalan army. Four out of every five victims were indigenous. Four hundred indigenous villages were wiped off the face of the earth. Impunity was the norm for many years, even after the conflict ended and peace accords were signed in 1996. But over the past 10 years, thanks to the persistent demands of victims and new generations of prosecutors and judges unencumbered by past fears, Guatemala has made impressive strides in bringing war criminals to justice. To date, Guatemalan courts have convicted 33 military officials, military commissioners and paramilitaries for a series of human rights violations, including enforced disappearances, massacres, torture, sexual violence and sexual slavery. Courts have also convicted one guerrilla leader for a 1988 massacre. Among those convicted are powerful men like Benedicto Lucas García, former chief of the army general staff, trained at the infamous U.S. Army School of the Americas and the architect of Guatemala's bloody counterinsurgency policy. In May of last year, he was sentenced to 58 years in prison for crimes against humanity and the aggravated sexual assault of political activist Emma Molina Theissen, as well as the enforced disappearance of her 14-year-old brother. Guatemala's Congress is now poised to reverse all of this progress. Last month, lawmakers approved moving to vote on proposed legislation that would free all those convicted or awaiting trial for human rights violations within 24 hours of its promulgation. It would also ban all future prosecutions related to wartime atrocities. Signing the amnesty bill into law would have a grievous and widespread impact. It would further decimate the little trust that surveys show Guatemalans place in their state institutions. It would re-traumatize victims. It could put the lawyers, judges and families who have made the fight for accountability their life's work at risk of retaliation, as recently expressed by United Nations human rights commissioner Michelle Bachelet. What's especially concerning is that this push to let war criminals walk free is happening amidst a broader effort to make impunity the norm for elites, as corrupt officials seek to kick out an international anti-corruption body and restore their unfettered power and privilege over Guatemalan society. This all-out assault against the rule of law in Guatemala is being spearheaded by President Jimmy Morales, who came to power in 2015 after massive anti-corruption protests brought down the sitting president, vice president and dozens of other government officials. Morales' campaign slogan seemed primed for the moment: "I am neither corrupt nor a thief." Yet when U.N.-backed anti-corruption body the International Commission Against Impunity in Guatemala, known by its Spanish initials CICIG, and the Attorney General's Office sought to investigate Morales and his party, the National Convergence Front, for illicit campaign contributions, Morales launched an offensive against the commission. Last August, surrounded by dozens of military officials, Morales announced that he was not renewing the CICIG's mandate, which was set to expire in September 2019, and barred its chief, Iván Velásquez, from returning to the country. In January, he announced he was shuttering the CICIG's doors entirely. He has repeatedly defied court orders to allow the commission to continue its work through the end of its mandate, pushing Guatemala to the brink of a constitutional crisis. Morales has a personal dog in this fight. He has avoided impeachment charges over the alleged campaign finance crimes so far, but these violations have also brought election authorities close to dismantling the party that brought him to the presidency. Investigators have also brought charges against his brother and his son for corruption. But the assault on the CICIG transcends President Morales. It involves the very corrupt structures, rooted in the military old guard, that the CICIG was created to eradicate in the first place, and that stand to benefit significantly should Congress pass the amnesty law. In fact, Morales' victory in 2015 was the result of an alliance with powerful ex-military officials, business elites and evangelists. Investigations by the CICIG and the Attorney General's Office into representatives from these different special interest groups has spurred the campaign to rid the country of the CICIG and undercut the autonomy of key democratic institutions, including the Attorney General's Office and the courts. Many of the former military officials close to President Morales have been implicated in or face trial for conflict-era human rights violations. One example is Edgar Justino Ovalle Maldonado. One of several ex-military officials who founded the National Convergence Front in 2008, Ovalle recruited Morales to be its presidential candidate in 2015. As head of the party, Ovalle was elected to Congress in 2015 and wielded tremendous power as Morales' closest adviser. That shielded him from prosecution when investigators sought his arrest in January 2016 on charges of crimes against humanity, in relation to the enforced disappearance of at least 565 victims at the height of Guatemala's civil conflict. It is one of the largest cases of enforced disappearance in Latin America. However, after Ovalle's immunity was lifted in late 2017, he went into hiding and remains a fugitive. Other former retired military officials charged in that disappearances case have also either fled Guatemala or are still awaiting trial in the country. If the amnesty law passes, investigators would have to drop all their cases. Approval of the amnesty bill would put Guatemala in violation of international law, which prohibits amnesties, statutes of limitations or other mechanisms designed to protect human rights violators from prosecution. It would also undermine a decade of progress in reckoning with a violent past and building Guatemalans' faith in democratic institutions like the Attorney General's Office and the courts, which are the foundation of the rule of law and democratic governance. The U.S. government has strongly supported criminal prosecutions of war crimes in Guatemala. U.S. Congress members and the State Department should tell Guatemala in no uncertain terms that they must not grant amnesty for war criminals. Doing so paves the way for a new reign of impunity, one that will imperil the peace, hobble rule of law and exacerbate migration.